There was an octopus at the nativity? AND a lobster? Little boy falls in love with a little girl and becomes a rock drummer. Writer falls in love with his maid and doesn't care when his book gets ruined. The Prime Minister tells off the President of the US and then falls in love with a member of his staff. A British nerd "with a big knob" finds out what an accent will do for you in the States. 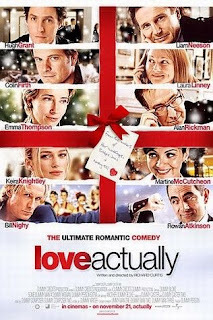 Love, actually is, all around, but sometimes love doesn't work out.